There is a classic principle in the internal arts (specifically taijiquan) commonly referred to as “the rule against double weighting”. To me, this is one of the most misunderstood principles associated with the internal arts. Many proponents of this principle will insist that the body should never “double-weighted”. In other words, weight is always biased on one leg or the other, not distributed equally over both. The fallacy: your body inevitably passes through double-weighted points! In literal terms the “rule against double weighting” is clearly a fallacy. Consider for a moment that you will, sooner or later, have to transfer your body weight from one leg to another. And as you do so your body will have to pass through a point where your weight is, however transiently, evenly distributed over both legs. In Chen Pan Ling taijiquan we acknowledge this fact. There is even a “50/50” stance (shock horror!). I have no difficulty with this. The 50/50 stance is a transitional point in transferring weight from the front foot to the back. In our taijiquan it occurs in the movements commonly called “play the lute” and “grasp bird’s tail”. 1 It is not “held”, but its existence at a point in time is acknowledged nonetheless. It seems to me that this interpretation of the “rule against double weighting” springs from a (flawed) static analysis of arts like taijiquan – ie. as if they comprised a series of postures. In fact, as I’ve outlined in my article “Taiji and yoga: poles apart?” internal arts like taijiquan are about movement – ie. the transition between “postures”. They are not about the “postures” themselves. So, for example, the taiji sequence known as “single whip” is not a “posture” as per yoga. It is a series of movements. 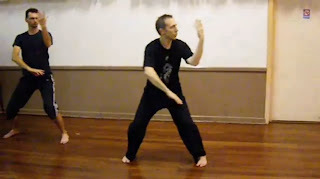 It ends with the characteristic “single whip posture” but this is not a posture to be “held”; it is merely “passed through”. The “rule against double weighting” however is commonly regarded as assuming the very opposite; it is seen as sternly instructing you not to “assume a particular posture that has your weight evenly distributed”! Is the horse stance incompatible with "the rule against double weighting"? 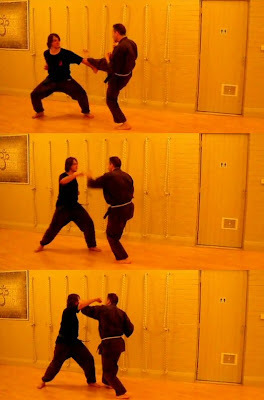 As a consequence, the “rule against double weighting” results in many internal arts schools supposedly never using/teaching “mabu” (known as "kiba/shiko dachi" in Japanese) – ie. horse stance. This is because that stance is manifestly “double-weighted” – at least when one examines the stance statically. However, as I’ve discussed, I don’t see any reason for thinking that horse stance, or any other stance, is incompatible with taijiquan or any of the internal arts – precisely because stances are never used statically. So it should come as no surprise that in the Chen Pan Ling system the horse stance is very often used. It might not appear very often in xingyiquan2, but it certainly does appear in baguazhang and in taijiquan (in respect of the latter, think of the move known as “wave hands like clouds”). Again, the horse stance is not “held” – it is passed through. I’m sure this occurs even in those schools that rigidly maintain a “rule against double weighting”; if you slow down video performances of their forms, you note that practitioners routinely pass through positions that are, for all intents and purposes, a horse stance (or, for that matter, the Chen Pan Ling “50/50” stance, etc.). All that differentiates these schools is that they won’t acknowledge, or aren’t aware of, this fact! But even if we removed all the "even distribution" stances, we are left with one, most salient, fact: most of the time that you are practising taiji, bagua or xingyi you are "double-weighted". True, your weight might not be evenly distributed - but it is distributed to both legs to some extent (eg. 60/40, 70/30, 90/10 etc.). Let's just say that you don't spend most of your time on one leg (ie. you aren't truly "single-weighted")! In the internal arts you don't literally spend your time being "single-weighted". What do you spend your time doing? Moving from one leg to another! In other words, you spend most of your time transferring from one single-weighted position to another single-weighted position. So the rule does relate to "single-weightedness" - just not in the way people assume, using a static analysis. In the art of taijiquan, weight is continually being transferred from one leg to another. 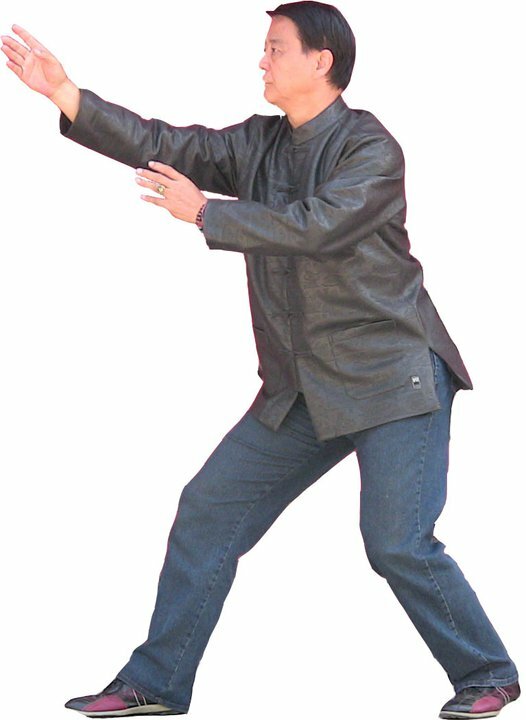 In baguazhang forward movement is continually being redirected into a coil that loops around and resumes the movement in the opposite direction. 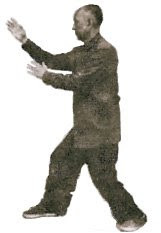 In xingyi you “restart” your momentum after each focussed “fajin” strike by lifting your front foot and “dropping” directly into another step. This is all in accordance with a principle I prefer to call “preservation of momentum”. Under this principle you should harness your natural momentum and use to its full potential. If you are moving forward, you should harness your forward momentum, not fight it. Ditto with moving backward, sideways, up or down. In other words your body is like the water in a river - never pausing, but flowing (as one would expect of Daoist/Taoist arts). You shouldn’t try to resist or halt the natural/optimal flow of your momentum; this is clumsy, costly and leaves you “flat-footed” and open to attack. Rather you try to use your natural/optimal lines of flow to your advantage – both to make efficient your deflection and evasion and add force to your attack.4 And the more senior you get, the better your timing so as to ensure that your momentum is “going where you want it to go” in the first place! So, for example, let us assume that you’ve executed a committed front kick (ie. not one that snaps back, but one that thrusts or pushes forward into your opponent). If it lands, but is not determinative of removing the threat, you will want to press your attack. In other words, you will want to “preserve” your forward momentum. Your second and subsequent attacks should flow in a continuous stream; any interruption just gives your opponent chances to evade/deflect you and resume attacking. Any “in between” movements should be geared at setting up the next strike by unbalancing your opponent and heading off or shutting down his defensive options. But what if your initial kick is evaded or deflected just before it lands, leaving you falling forward – straight into a counter attack? Should you “put on the brakes” and try to stop? The principle of preservation of momentum would say “No!” Why? First, it isn’t really plausible to “stop” a committed attack. You can only stop an attack that is executed very slowly or without commitment or both. If your attack has speed and weight behind it, you will find it impossible to stop when it unexpectedly misses or is diverted. In other words, “putting on the brakes” won’t have the effect of stopping your punch once you realise you’ve been thwarted: the evasion/deflection will occur, and your attack will miss – all in a fraction of a second. Any attempted “retraction” will happen after the fact. Second, let us examine what happens if you do “put on the brakes”: your attack will be evaded/deflected (as we have just discussed). And you will (pointlessly) bring your body to a grinding, shuddering halt soon afterwards. You will stop moving. But your opponent won’t: he or she will surface from the evasion/deflection to find you stationary – “flat footed” if you will – while he or she is still moving, continuing the momentum of the preceding evasion/deflection. In order to deal with your opponent’s inevitable counter, you will have to get your body moving again. Only you have to do so from a “standing start”. Accelerating from zero takes time; just ask any motoring enthusiast.5 Moreover it is wasteful of the resource you already had – your original momentum. So what should you do when your committed attack is evaded or deflected? You certainly don’t want to try to “stop” – even if you find yourself falling unexpectedly into a counter punch. The principle of preservation of momentum would instead dictate that you go with the forward momentum and use that until it is exhausted. This might involve smothering the blow into which you are flying, perhaps by adding even more speed to your forward movement (ie. increasing your commitment). In reality, you don’t have many options in the scenario I’ve painted. Because if you’re about to fall into a punch, trying to backpedal is guaranteed to fail. Even if you somehow manage to backpedal enough so as to take some of the edge off the blow, you will inevitably be set up for successive attacks. In that circumstance, pressing your forward momentum and “converting” your attack into an aggressive defence is your only logical option. A video where I teach how to convert “failed attacks” into positive defences and counters (while maintaining your momentum flow). Note how the opening kick is deflected and you find yourself falling into a punch. It would be a mistake to try to “stop” your forward momentum. Instead you should use that momentum to aid your defence. While I have long maintained that “blocking and countering” necessarily occur one after the other in a logical, sequential sense, I am quite passionate about keeping the time between those events to an absolute minimum. You can do this by making sure your momentum flow is constant. If you stop yourself, you have to restart. This is usually fatal to your defence. xingyiquan uses “falling momentum” – using gravity to refuel your expanded or retracted movement. I shall expand on each of these methods of “preserving momentum” in another article titled "Preservation of momentum: the key to internal arts effectiveness". For the time being it is sufficient to note that each of these methods works at keeping your momentum flowing. That is the modus operandi of the internal arts. The very opposite of the internal arts is where you are caught “flat footed” or “bouncing up and down” on the same spot (which is another way of being “flat footed”). These approaches might work to some extent in a competition6, but only because there is a lengthy “pre-engagement” phase before you move into the melee range. By contrast, civilian defence scenarios are defined (as I have frequently argued) by the melee range. And in the melee range, movement is always constant. By “civilian defence scenario” I’m not talking about the “push and shove” of pre-conflict theatrics (something Rory Miller calls the “monkey dance”). As interesting and pertinent as it is to study this aspect of human dynamics, it is not really the concern of civilian defence arts (like the internal arts or karate etc.). Rather these deal with the point at which your attacker throws his or her first punch/kick/strike, and onwards.7 And this all happens in the melee range. In the melee range there is a huge premium on keeping your momentum flowing constantly. Why? Because, chances are, it will anyway! Any attempt to halt your momentum artificially in a melee exchange is nothing short of pure insanity. As punches are flying at you, you simply don’t have even the slightest chance (or reason) to assume an even-weighted “preparatory” stance – or worse, start bouncing up and down. If you tried to do so, it would just give your opponent open slather to knock your head off. And this, ladies and gentlemen, is one of the main reasons I disagree with the “hip wobbling” engaged in certain schools for “power generation”. It is in direct conflict with the internal arts principle of preservation of momentum. Rather than preserve, and utilise efficiently, your natural flow of momentum in the melee environment, it attempts to “stop” that momentum and replace it with extraneous, non-contextual movement. As I’ve explained in my article “What I mean by ‘contextual hip loading’”, when I refer to “context” I’m not referring to what your opponent might or might not be doing. I’m talking about the context ofyour own movement. So if your hips are moving clockwise at a particular time, then for heaven’s sake use that clockwise turn! Don’t try to halt that movement, throw your hips into reverse (an anti-clockwise turn), then go back to the clockwise movement again, all for the sake of “extra power”. Even if you’re as fast as Peter Consterdine or any other good exponent of the “double hip”8 method, you won’t make up for the fact that you’ve “taken time out” of your natural momentum flow. In that time you will have “stopped” your natural momentum. In less correct terminology, you will be “double-weighted”. This is not only inconsistent with taijiquan principles, but with melee range dynamics and... well... common sense! Because any time that you stop, your opponent won’t. He (or she) will continue to try to punch, kick, strike etc. without any regard for your “power strategy”. So “double weighting” in the sense of having your weight evenly distributed over both feet is a reality. It occurs in every movement. The internal arts are not defined by an absence of such "double weighting" any more than they are defined by an absence of horse stances or any other posture. Rather, what defines the internal arts is what I call the principle of preservation of momentum – ie. the fact that the natural flow of your momentum is never halted or stifled. Put another way, there is never a point where you are not in the process of moving from one "single-weighted" position to another. Morever, the internal arts are designed to harness your momentum flow at any particular point so that it can be used to your advantage – whether it be moving forwards, backwards, sideways, up or down. The arts are built around this principle in both attack and defence strategies. And it is important to note that the internal arts do more than keep your own momentum flowing: they are proactive in setting up ideal momentum flow situations from your perspective (in the sense of being in the right place, and moving in the right direction, at the right time). Last, they also work to harness your opponent's momentum against your opponent.3 In other words, they are carefully designed to absorb and/or redirect momentum back onto your opponent. In doing so, the internal arts maximise your own applied force while simultaneously shutting off possible counters and escapes to your own offensive. They act like a sticky web, pulling the opponent in to a situation from where there is no escape; his momentum is exhausted or being redirected to his detriment; yours is falling directly onto him, adding to the total momentum "pool" and increasing the force applied to him. In my next article "Preservation of momentum: the key to internal arts effectiveness" I shall expand on the mechanics behind this process, giving examples from each of the internal arts. To my mind this is far more interesting than some dogmatic (and patently absurd) rule about never being in a stance where your weight is evenly distributed over both feet. 1. 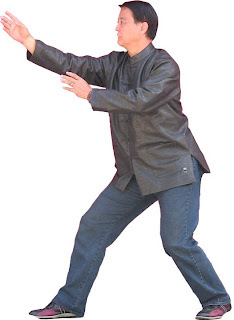 The Chen Pan Ling “50/50” stance is a close cousin of what I call the “battle stance” (zhan bu or the stance adopted in the “san ti” posture of xingyi, which is slightly rear-weighted). The weight is evenly distributed typically as you intercept an attack, the even weighting giving you extra stability. The weight is immediately transferred to the back leg after interception. As I have said, the stance is not “held”; it is merely acknowledged as a critical point in time during the (uninterrupted) transfer of your weight to your back leg. 2.The “mabu” or horse stance doesn’t feature in the Chen Pan Ling 5 elements, but it does feature in lian huan quan (the 5 elements linking form) and in some of the 12 animal forms. "Although there is some logic behind the definition of Double Weighting as standing with the weight evenly distributed between both feet, and this is the 'party line' explanation, it is not accurate. When you read the Tai Ji Quan Classics in the original Chinese, the definition and explanation of double weighting is clear and unambiguous. Double weighting refers to using force directly against the force of another. The use of my force (weight) against your force (weight) creates two 'weights' (centers). When two separate centers of gravity are contending, the stronger always wins. This state occurs naturally when the untrained fight and is not martial art. The underlying principle of Tai Ji Quan application is to join centers with your opponent (one weight) from a dominant position so that you may 'borrow the opponent's force' and lead him into your technique. It is interesting to note in the Tai Ji Quan Classics that Double Weighting is considered an "illness," and the reason practitioners are not successful even after years of training. The key is to join centers with the opponent and move him as a part of yourself. I think this is the flip side to my argument - the benefit of proper preservation of momentum. It is one thing to say that the internal arts will enable you to "join centers" etc. - but how do they achieve this? I believe that if your momentum is flowing efficiently/optimally, this should enable you to harness your opponent's momentum against him or her. The exact method by which you achieve this depends on the interplay of his/her momentum and your own, and each of the internal arts adopts a slightly different approach to obtain similar outcomes. I propose to deal with the exact science of this process in my article "Preservation of momentum: the key to internal arts effectiveness". 4. This is in accordance with the Daoist/Taoist principle of "wu-wei" which means "no unnecessary/unnatural action". This is not an instruction, but rather a description of an ideal state of affairs - where you do nothing, yet everything is accomplished. Another way of describing wu-wei is as "the way of least resistance" (ie. the title of this blog). 5. Most manufacturers of sports cars will boast about the time it takes for their vehicle to go from 0 to 100 km/h. Why? A top speed, however impressive, would not be terribly interesting to a sports car enthusiasts if it were reached over a period of, say, an hour. For performance you need good acceleration. Similarly, acceleration is the key to good martial skill. Regardless, you should avoid having to accelerate from a standing start except where necessary (ie. against the first attack). 6. I personally don’t think bouncing confers any advantage in the “pre-engagement” phase. Rather, I think it is a daft idea, as I discuss in my article “Faux boxing”. But I mention it here because some folks do nonetheless “make it work” well enough in pre-engagement. I think any success is achieved despite the bouncing, but that is another thing. Certainly, whichever way you cut it, there is simply no way you can bounce when you are engaged with your opponent in the melee range. 7. If you think about it, no form/kata of any traditional eastern art features any movements that pertain to the “monkey dance” – the pre-fighting “theatrics”. When have you seen a traditional form that teaches you to deal with this aspect of civilian defence? The answer is: never. Now I agree that there are many useful tactics for diffusing a potential conflict without compromising your safety. These range from the appropriate awareness when you are walking along a street at night to reading the body language and other cues of someone who is a potential attacker. It includes the commonly taught “disguised guards” – eg. the “open hand” posture (as if to say “hold on my friend!”) or that taught by the late Erle Montaigue (and more recently shown to me by Richard Norton) where you cross your arms and put one thumb up to your chin (as if you are contemplating what your opponent is saying). These sorts of measures will help prepare you for any forthcoming attack. But, rightly or wrongly, they are not part of any traditional civilian defence art. Rather, the latter all assume that the first punch has been, or is being, thrown. your return to the to the clockwise movement again (hip movement No. 3)! Interesting article on a subject rife with controversy. There are multiple explanations existing on this subject and it seems all have some validity, on some level. A discussion well worth considering in depth, and affecting one's understanding of "Push Hands" etc. Well, there's physical double-weighting and mental double-weighting. One is impossible to completely avoid (unless you don't move ;) but the other is not. If I were to summarize my view, it would be that it's okay to pass through double-weighted points, just not to linger there. I think this the physical embodiment of the mental state you describe Eastpaw. Thanks again for reading and for your comments! Anyway, the topic is discussed by many, and of course, in solo form we all pass through 50/50 moments, but really never hold such "horses", at least not in the Yang (4) and Chen (3) variants, I practice. More of interest to me is this concept in partner work, where we can paly and test lots of different situations, with and without double weighting. It seems to me that CIMA avoid hard on hard, soft on soft, but then, we are back to your blcking articles, aren't we? Thanks, as always, for reading, your comments and your friendship Hermann. You will be pleased to know that I plan more internal martial arts articles in the near future! Still being a newcomer to the internal arts, one thing has always stuck with me...the premise of transition. You never have a static stance, you always immediately dissolve to the next stance or posture. So to my mind, it's about dynamics rather than statics. Fluidity rather than solidity. Just as you argue that there is no static double weighting, there is an instantaneous movement through a double weighting into another stance, I would assume the same logic would apply for all other postures. Within taiji particularly, there is no static cat stance, no static single-whip, no static gong bu but a dynamic and instantaneous movement through each of these. I suppose part of the progress to improvement is to limit the static components of the art and maximise the fluidity and ability to instantaneously dissolve one posture into the next. I remember you talking about the woman you observed practicing in the park in Taiwan and at first glance she wasn't moving...but upon closer observation there was a very slow definitive movement - never static, but almost imperceptibly dynamic, through every aspect of the form. That, to me, is part of the art. That is why I choose to speak of "preservation of momentum" (I was going to use "conservation of momentum", but that is a term in physics and I didn't want to confuse the issue) rather than "double weighting". To me your "weighting" at particular points is largely irrelevant. As you have pointed out, it is about the transition between those points that is crucial to the internal arts. I've only heard of double heavy and double light weighting. Where one's momentum is going forward and one's weight is on the lead foot, double heavy. Or double light where the weight is on the backfoot and the body momentum is going backwards.